I apologize if this is a bit late, but we’re in between two sci-fi cons and life keeps getting in the way. We hope to see you this weekend at Conclave in Dearborn, Michigan. After seeing this week’s episode, Under the Lake, I am in two minds about it. First off, the special effects and sets are superb. 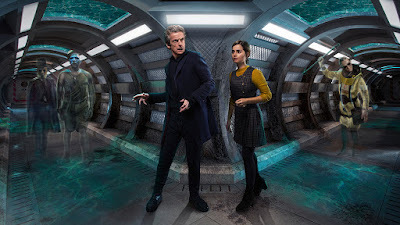 When the Doctor and Clara walk out of the TARDIS and into the underwater base it looked like the real deal and had that “lived-in” look. Very nicely done! Secondly, the viewer has to check his/her brain in at the door when trying to explain the plot to another person because the logic gaps in the story are bigger than a sinkhole after a flood. Since I live with a British person, I usually go to him for explanation about the setting. He informs me that the town in Scotland isn’t on a lake but lies along the North Sea, so the title seems a bit misleading. Even if it’s one hundred years into the future and climate change has raised the ocean levels, this town in Scotland probably isn’t going under he assures me since Scotland is actually rising up as the southern part of Great Britain tilts down and will receive the worse of the sea inundation. So, are they in “fresh water” or “salt water” in this story? Confusing. Another confusing story detail—why would they be drilling for oil in Scotland a century from now? Sure, it could be used for plastics and the like, but wouldn’t they still be pumping the petroleum from the North Sea platforms and using the sideways drilling techniques the fracking industry espouses? And why would you go underwater and live in an underwater base to drill in the first place? It’s pretty costly. Once again, geography and geology don’t quite jive. Doctor Who has traveled a long way from its original premise of being a family friendly show that tries to teach science and history to its audience. The “ghosts” haunting the underwater base were creepy, but I also found them somewhat confusing. They could lift and carry solid objects of size, but then they couldn’t take them through walls with them. Usually, ghosts can’t touch or manipulate solid matter, so perhaps next week we’ll find out what they really are? Aliens? Here’s hoping! The casting of a deaf actress (one assumes) as leader of the group was a pleasant surprise. 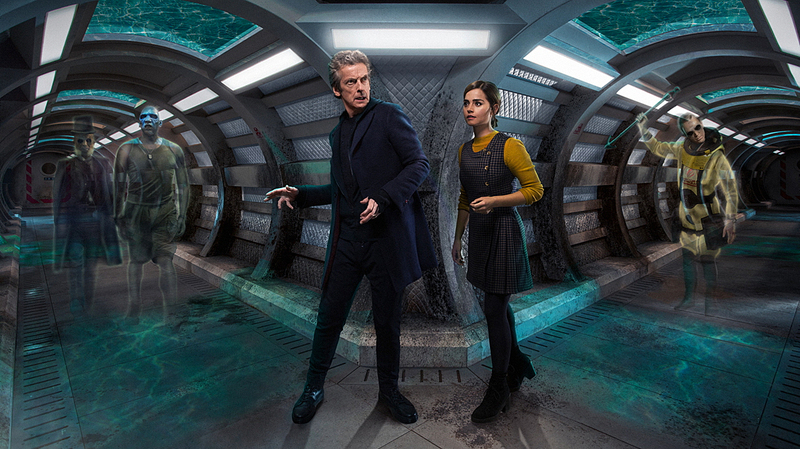 It’s nice to know the Doctor can read sign language even if he can’t figure out the alien runes on the inside of the spaceship. But what really had us scratching our heads was the idea that the “ghosts” were sending out a message to a rescue mission somewhere in the vicinity of the constellation of Orion. Somehow, by killing more and more humans, it makes a stronger “signal” to broadcast to the alien rescuers. Huh? Last time I checked, usually you needed a device such as a radio dish to send out a message across interstellar space. Maybe this bit of confusion will also be solved by next week’s episode? I found Peter Capaldi channeling Tom Baker throughout Under the Lake intriguing. He’s slightly more lovable this season so far, even when he’s acting arrogant and ill-mannered. Clara’s personality has all the clarity of a cipher, however. No flashbacks to her horrible experiences losing her boyfriend at all? It’s like she’s a completely different young woman. Odd, really. Whenever most people lose a loved one it leaves a lasting mark on the psyche that’s noticeable by their words and actions. Creepy baddies and a cool set are nice, but a story and characters that aren’t as full of holes as Swiss cheese would be welcome. I *love* the sets for this episode. I like the acting. The storyline is full of holes, though. Quite why an advanced alien race should require 'ghosts' to boost their distress signal beats me. 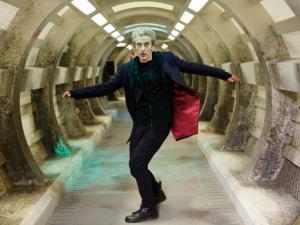 I really hope someone pries Moffatt's hands from Doctor Who before he wrecks it. I agree with you, AJ. The underwater base is nicely realized. One hopes that the producers would spend money on more than just sets and SFX and think that makes for a superior episode. Doesn't George Lucas' "The Phantom Menance" prove that bigger and better sets/SFX alone don't make for an interesting story? I feel cheated as a viewer that somehow I have to turn off my "higher levels of brain function" to watch/enjoy a Moffat produced script. Get the science right! It's not that difficult. A decent story editor would have done the research and made appropriate suggestions to fix the logic gaps. Are the producers ignoring the series' story editor? You do so at your own peril, I'd say!